You’re not Rick Schwartz. So don’t try to emulate him. Your own circumstances probably don’t align with the most successful domain name investors. This isn’t an article picking on domain name investor Rick Schwartz. I’m just going to use him as an example. Rick has made a lot of money investing in domain names. He got in early, kept the faith, and has a negotiating style that leads to chart-topping sales. Assuming you did not get in early and don’t have millions in the bank, you shouldn’t try to emulate everything he does. I bring this up because I sometimes hear people say “Play hard to get” with domain buyers. String them along. If they really want the domain they will find a way to reach out to you and make it known. This strategy makes a lot of sense for Rick. He’s not going to have to skip dinner if he doesn’t make that $250,000 domain sale. 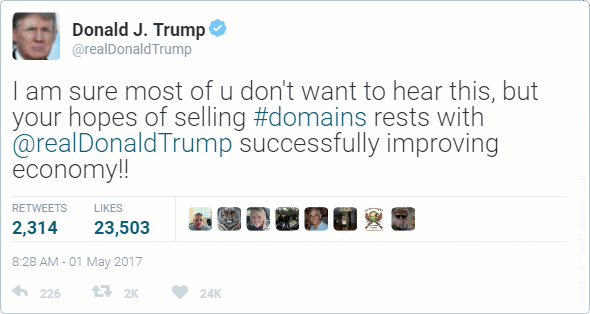 What if Donald Trump tweeted about domain names? It would probably look a lot like this. Twitter has given Donald Trump an easy and direct way to reach his fans at any time of day, even (especially) at 3 am.